3. Sleep Sack in photo was made using Caron One Pound. If you are using a thinner worsted weight yarn an I (5.5 mm) hook would be more suitable. The sleep sack will be smaller. 4. Actual measurements 30 inch circumference and 22 inch length. To make longer repeat rounds 10 and 11 until desired length. Rounds 12-43: Repeat rounds 10 and 11. End with round 11. Measure sleep sack, if it isn’t between 21 and 22 inches, work rounds 10 and 11 until it is. Complete cap with one of the following edges. 1. The first 14 rounds are worked in continuous rounds. Move your marker up every round. Thank you for making this larger version of my favorite sleep sack. I had made your smaller version with worsted weight yarn and wanted to make another but I only had light weight (3) baby yarn. I used a size G (6) hook and it worked up to about the same size as the smaller pattern. 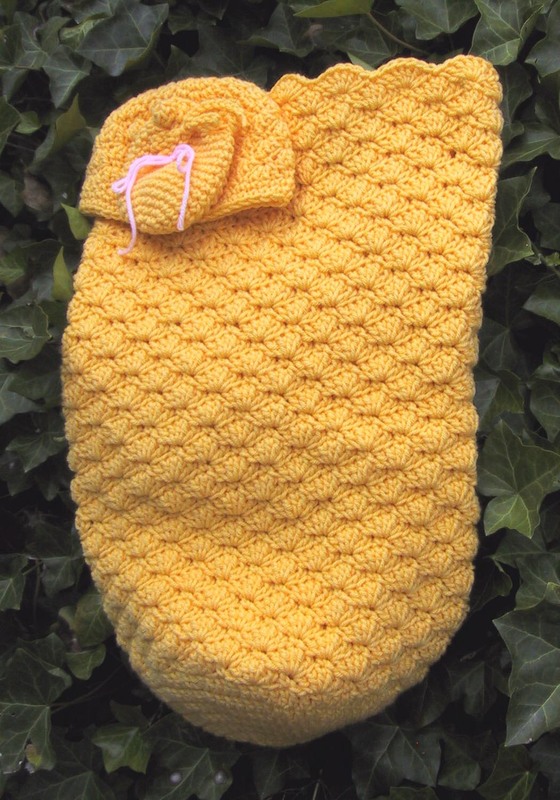 Perfect for those new little ones in super soft baby yarn. Love your website! Please keep up the great work. In the next 2 dc, that brings you to the center of the shell. As it happens I'm working on one of these tonight as well. One of my fave things to doante. Thank you Suzetta for answering my question so soon. I know this sleep sack is going to be soft and gorgeous. It is for my granddaughter that is expected to be born in July. I hope to keep this as a surprise for the baby shower. Thanks again. This is a fantastic pattern - I have made about a dozen - everyone loves them! Work even mean to work without increases or decreases on the same number of stitches. I made this and it is lovely- thank you for the pattern. It will be a nice gift with the hat. I am more of a knitter, and when I crochet- especially in the round- I can never get the counts to come out right. But this time I was right on every round! Your instructions were excellent. Thanks again. You did it, now you will feel like tackling some other crochet patterns. Thank you for the lovely pattern. I made one for my grandson and another I am just finishing as a donation for our local libray basket social. Thank you so much for this pattern. Today i made the sleep sack and the matching cap. They are so cute. i can't wait to give them to the new baby! Thank you for this beautiful Cocoon pattern, everything went well up to round 9 I got 15 shells, when i finished round 10 I am ending up with more than 15 I got 19, then round 11 I got 22 or 23, I re-did the work at round 10 following round 9 instructions, I ended up with 13 shells. (*Skip 2 dc, sc in next dc, 5 dc in next sc* )does that mean skipping the dc or skipping a stitch (which are the SC from round 9) either way I'm not reaching 15 shells in round 10, Please help !! You will be working a sc in the center dc of each shell and a shell (5 dc) in the sc between shells. If you are ending up with more than 15 shells you are working into some other stitches. Thank you Suzie for the reply, I am almost done with the cocoon and it's looking fabulous and getting lots of compliments on it already, Can't wait to start on the cap. You skip the last 2 stitches and slip stitch in the first single crochet. I made 2 of these lovely shell sleep sacks and hats, one each of the wavy and ripple sacks and hats, combined them with matching fleece onesies and sent them to the Pine Ridge OB Ward on the Pine Ridge Reservation. About 30 babies are born there each month and go home to little or nothing. Your patterns are so easy to follow, and turn out so beautifully. Thank you for your wonderful website. Thank you so much for posting this pattern! It works up so nice and easy. I have made both the sleep sack and cap as a gift for one of my friends who will be having a baby soon. I love them, and I hope she does too! I measure from the very bottom, but I think the length could be what ever you like. For the sleep sac...Row 10 and 11 basically say "sc, 5 dc in next, sk 2". I am wondering if there should be a skip 2 in between the sc and the 5 dc? The hat pattern has it that way and row 9 does as well. Mine does not seem to be looking right. Love this pattern and appreciate your hard work, just wish mine would turn out right!!!!! Thanks for the help. The pattern looks like it is written correctly to me. Granted it has been a long time since I crocheted one, but I think if you just work it as written it will be okay. I am stuck on row 4, if I do what I understand the pattern says I end up with 36 stitches, if if leave out the skipped stitch I end up with 52 stitches instead of 48. What am I doing wrong. Please advise. You should be increasing 12 sts by working two sts in every third st. Even though they are all classed as 4 these yarns will all give different results. Caron One Pound is the heaviest of the commonly available yarns I use for babies and charities. The difference in hook names is why I also provide the size in millimeters. Yarn size can make a big difference as well. Even within the new yarn size designations there are large variations. One that come to mind off hand is the difference between Lion Brand Pound of Love and Caron One Pound. Both are designated 4, but there is quite a large difference. I'm coming up with a 10 in circumf at the end of round 8 I thought it should be bigger? I'm using a worsted weight yarn and a size I 9 or 5.5 mm needle. Could you tell me if this is ok? No that doesn't sound right for the circumference at that point. 90 double crochet should equal more than that. There is a lot of variation in sizes of worsted weight yarns. Love the pattern! Quick, easy and beautiful! Thank you, your comment gave me a lift on a day I needed one.